Exercise is so cool! It keeps our body healthy and strong. 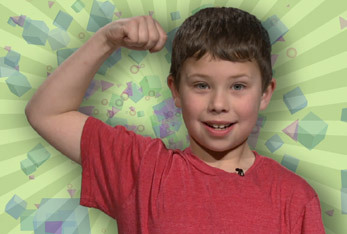 As kids need 60 minutes of physical activity every day. That's right! 60 minutes every day. Did you know that exercising helps keep our heart, muscles and bones strong and flexible? It also increases stamina and makes us feel better too. There are two types of exercises, Aerobic and Non-Aerobic. Aerobic exercises require a lot of air like swimming, biking or jumping rope. These type of activities demand lots of oxygen and really get our heart pumping. Aerobic exercises are good for our heart and help keep us strong. They also burn lots of calories making it easier to maintain a healthy weight. Aerobic exercises can also increase our stamina. 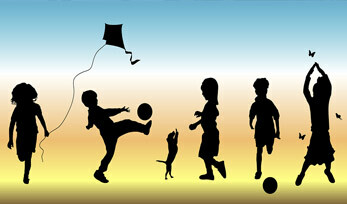 Aerobic activities like running, playing soccer and roller skating, may make one tired at first, but if you keep with it, you'll be able to play longer without getting tired. Non-Aerobic exercises are equally important. They also help make our body strong and flexible. Non-Aerobic exercises like yoga, ballet and gymnastic increase our flexibility. Bending and stretching our muscles keeps them long, strong and pliable, and less prone to injury. Both forms of exercising can put you in a better mood. When you exercise your brain releases chemicals, called endorphins, that makes you feel happier. It also activates the immune system, helping us to stay well and feel good. Our brains like it too! Exercise increases the oxygen to our brain making us all think clearer and feel better. Move It! Groove It! Bend It! Stretch It! 60 Minutes Every Day. 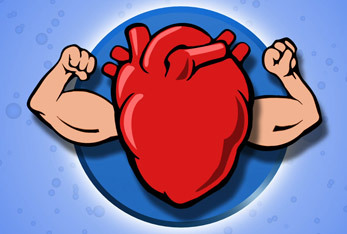 Did you know your heart is a muscle working hard pumping blood every day? This muscle needs exercise to stay strong and get stronger. Aerobic exercise gives your heart the kind of work out it needs. The word Aerobic means "with air". So activities that require lots of oxygen and really get our heart pumping are called aerobic exercises. Fun activities like swimming, biking, jumping rope, jogging, and playing basketball are all aerobic exercises. Doing aerobic exercise on a regular basis will make your heart healthy and strong. So, make your heart healthy and happy. Get moving!